A BRIEF HISTORY OF THE FREE BEER & HOT WINGS SHOW. The Free Beer & Hot Wings Show began as an afternoon show in Omaha, NE at non-commercial radio station KIWR in March of 1997. The Show was comprised of two, former Central Michigan University roommates who eventually moved to mornings several months later where they remained until the summer of 2000 when they moved to WBON in Knoxville, TN. It was there that they met the show’s eventual 3rd member and other CMU grad, Eric Zane, who was, at the time, their direct competitor at WIMZ. When Zane was fired, he immediately drove across town and joined The Free Beer & Hot Wings Show. In June of 2002, The Show moved to New Jersey, where they were simulcast on WTHK in Trenton and WCHR on The Jersey Shore. 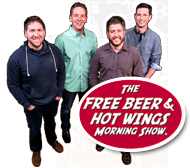 The Free Beer & Hot Wings Show began full syndication in 2004 with the addition of WGRD in Grand Rapids, MI and is now heard on radio stations in 25 different states. You can catch the guys Monday through Friday from 5am – 10am on The Laser!